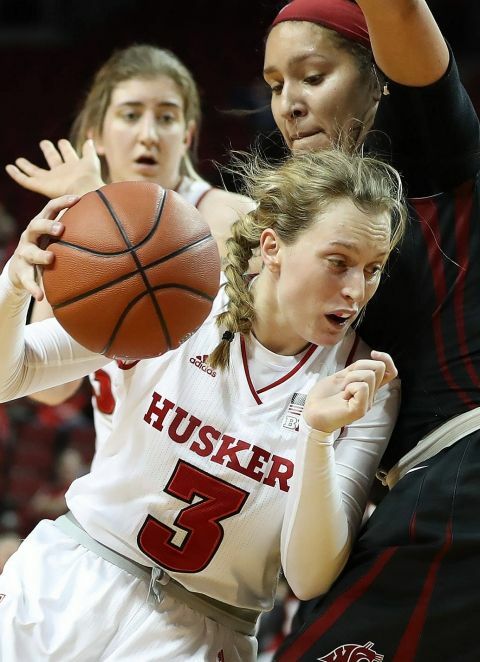 Emily Wood scored a career-high 19 points and hit a career-high five three-pointers off the bench, but it was not enough to prevent the Nebraska women’s basketball team from falling 73-61 to Washington State at Pinnacle Bank Arena on Friday afternoon. Playing in front of a season-high crowd of 4,404 and owning a five-game winning streak, the Huskers got off to a slow start, hitting just 2-of-12 shots in the first six minutes, as Washington State jumped out to a quick 11-4 lead. The Cougars kept applying the pressure at both ends, hitting 8-of-15 field goals and all four of their first quarter free throws to extend the margin to 23-11 at the end of the first period. The Huskers continued to struggle to convert in the second quarter, as WSU pushed its lead to 18 points late in the half before the Big Red cut the lead to 41-27 at the break after a buzzer-beating putback by Maddie Simon. The Cougars hit a sparkling 53.3 percent (16-30) of their first-half shots, including 5-of-13 threes (.385). WSU also outrebounded Nebraska, 24-16, but the Huskers won the first-half turnover battle, 12-9. The Huskers, who closed nonconference play at 9-4, struggled with their shooting strokes in the first half, hitting just 30.6 percent (11-36), including 3-of-8 threes with all three threes by Wood. Washington State, which improved to 7-5 with the win, quickly pushed the lead to 20 points by scoring the first six points of the second half before Nebraska rallied. The Huskers stormed back into the game with an 11-0 run over a 3:23 stretch to cut the margin to 47-38 with 4:59 left in the third quarter. Hannah Whitish, who finished with 18 points and game highs of six assists and three steals, scored five points during the surge. The Cougars pushed the margin back to 14, before Wood buried back-to-back threes to trim the WSU lead back to 10 at 58-48. However, the Cougars went to the final period with momentum after Caila Hailey banked in a long three-pointer at the buzzer for her first basket of the game. But the Big Red were not deterred, as Whitish sank a pair of three-pointers around a jumper from Wood to slash the WSU margin to seven at 64-57 with 8:21 left. The Huskers could get no closer, as the Cougars dominated the offensive glass in the final period and took the air out of the basketball to secure the road win. Nebraska, which scored eight points in the first 1:39 of the fourth quarter, finished with just 12 in the quarter, outscoring WSU 12-11 in the final period. Washington State had 11 fourth-quarter rebounds, including five offensive boards, to overcome a 4-for-15 shooting effort in the final period. For the game, Washington State outrebounded the Huskers 44-31 and outscored the Big Red in second-chance points, 21-12. The Cougars dominated inside, outscoring NU, 38-24 in the paint. Wood and Whitish were the only Huskers who finished in double figures, while Nicea Eliely contributed eight points, six rebounds, two assists, two steals and two blocks. Borislava Hristova and Alexys Swedlund each scored 16 points to lead the Cougars, while Louise Brown added a double-double with 12 points and a game-high 12 rebounds. Nike McClure also played a strong game inside for WSU with nine points and eight rebounds off the bench. Nebraska hit just 37.7 percent (23-61) of its shots from the field, including 7-of-16 threes (.438), while going 8-of-13 from the free throw line. The Huskers did win the turnover battle 19-17. Washington State hit 45.3 percent (29-64) of its shots, including 8-of-25 threes (.320). The Cougars also hit 7-of-8 free throws. The Huskers continue their three-game home stand with the opening of Big Ten Conference play on Thursday, Dec. 28, when they battle No. 12 Ohio State. Tip-off between the Big Red and the Buckeyes is set for 7 p.m., with tickets available now on Huskers.com.